Summer’s Here… Time for BBQ! My company hosted a BBQ during lunch today and I was super excited to partake in all the smoky/grilled/what-have-you goodness! #freefood The spread for this afternoon included slow-cooked BBQ ribs, grilled BBQ chicken, hamburgers, cheeseburgers, hot dogs, baked beans, corn on the cob, mac & cheese, french fries, and brownies. I was pleasantly surprised by the tastiness of the food I piled high onto my plate. Overall rating, fine, which is pretty good in my book! The only thing I definitely wouldn’t eat again was the hot dog (below average, bordering on no). Way too salty, even sans condiments! The mac & cheese (okay) didn’t have much flavor and was a tad bit dry, but it was bearable I suppose. New discovery today… baked beans as an alternative to ketchup on french fries is delicious! Everyone should give it a try. 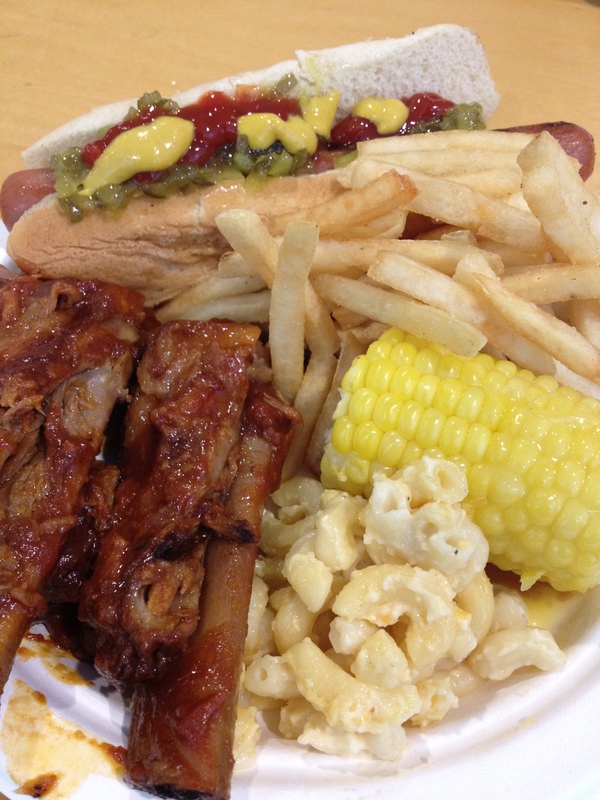 This entry was posted in American and tagged BBQ, slow-cooked ribs, summer foods. Bookmark the permalink.